“Cinépolis” was my final year project (NVQ in Computer Programming, 2010-2011, Madrid). I was aware that the final year project played a great role in displaying all that had been learnt during the computer programming studies. However, I wanted to take a step beyond, increasing my knowledge in programming and creating a final project slightly different from the others. Thus, I worked hard and I learnt WPF. 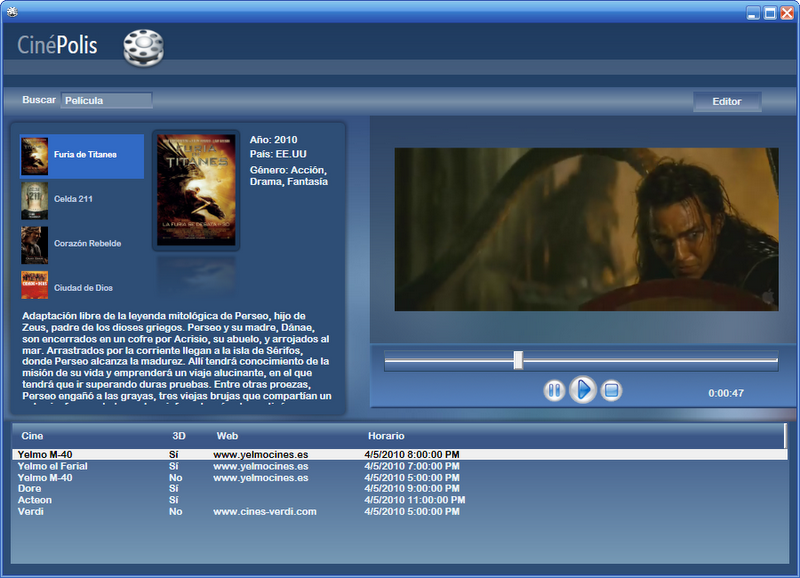 After four intensive weeks, I was ready to start my project: « Cinépolis, a Cinema Browser ». « Cinépolis » is an application that allows users to find a cinema for the movie they are looking for. The program works reading the information from an access database. When the movie is found, a list is shown. Once the movie is selected, its trailer is automatically played. The overview and the cinemas, plus some useful info, are also shown. This entry was posted in MaxScript & .NET by David M. Bookmark the permalink.